SHARE Forum is one of the essential networking platforms for the construction-related fields in Central and Eastern Europe. We bring together principal and senior architects from leading practices to discuss about their recently awarded projects from the greatest architectural competitions worldwide. In partnership with the Chamber of Architecture and Spatial Planning of Slovenia (ZAPS), by attending SHARE Ljubljana 2019 architects will receive ZAPS accreditation: 3 points. Also, we’re giving away 100 FREE tickets for ZAPS members. All you have to do is register for a standard ticket, and if you are a ZAP member just enter the voucher code: SHARESL2019. The code is only valid until Friday, March 8 CET at midnight. Architect Tomaž Krištof the President of Chamber of Architecture and Spatial Planning of Slovenia and Mr. Florin Mindrigiu, Event Director and Founder of Pro Event Association will open this year’s edition. Audience: Everyone from the architectural field is welcome to attend our event. Tickets are already available on our website (see the link on the right). International speakers from countries like Slovenia, Romania, Italy, France, Croatia, Turkey, The Netherlands and Finland confirmed their presence to SHARE Ljubljana 2019. We expect a big number of architects, landscape architects, designers, lighting designers, engineers, urbanists, real estate developers and from public institutions, architecture, and design students, companies with innovative solutions in the construction field, other professionals related to architecture field. 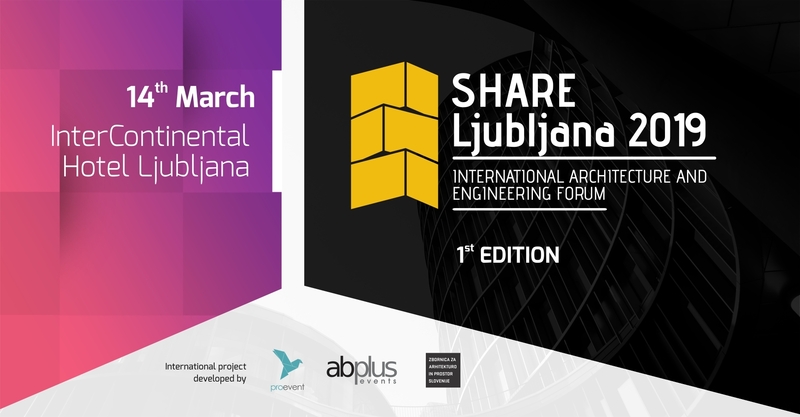 This edition of SHARE Ljubljana 2019 will have 3 panels: Large Scale Projects in Slovenia, Facades, and Special Guest Presentation. Special Guest Rainer MAHLAMÄKI, Co-founder of Lahdelma & Mahlamäki will hold a special presentation and debate. We invite you to meet our speakers and register for SHARE Ljubljana 2019! Long-term architectural partners Ilmari Lahdelma and Rainer Mahlamäki founded LM in 1997. Their work is a continuum of Finnish design, with a focus on sustainability, high-quality materials and attention to detail—qualities that come together with cutting-edge technologies and techniques. Both Lahdelma and Mahlamäki are internationally recognized and lauded architects, professors and lecturers. Arch. Rene van Zuuk (The Netherlands) – Founder at René van Zuuk Architekten bv, René van Zuuk Architekten bv is an agency that has been working on very different assignments since 1992. René van Zuuk Architekten bv stands for the realization of cost-conscious designs with a high architectural quality. Every project has its own visual language and its own character. In order to be able to guarantee this, the agency is involved in the entire construction process; from the first design sketch up to and including the delivery. Špela Videčnik (Slovenia) – Founder of OFIS arhitekti. Špela Videčnik graduated from the Ljubljana School of Architecture and London’s Architectural Association and established OFIS Arhitekti in 1998 along with her colleague Rok Oman. Their ambitious projects and architectural attitudes made Zaha Hadid to nominate them among the top 10 exceptional emerging architects for Phaidon 10×10, while the Guardian designated their office as one of five young architectural offices ‘to look out for’ in 2001. Since then, they have undertaken a diverse range of projects, from renovation to new-build and research prototypes, from small to large scale projects for many types of facilities. Their flexibility is the key to an architecture that responds to the ever-changing conditions in modern times. Most of their work is the result of winning competitions, including the student residence on Route des Petits Ponts in Paris and the Football Stadium Bate Arena in Belarus. Over the years, the two have realized numerous buildings in their home country of Slovenia, as well as in Germany, the UK, France and Spain and they are deeply involved in advocating the European and local Slovenian identity into a contemporary approach of architecture. Arch. Burak Pekoğlu (Turkey) – Founder BINAA. BINAA is a design and research studio, that was founded by Burak Pekoglu in 2012. The main objective of the studio is to generate conversations along the themes of Building, Innovation, Arts and Architecture with an exceptional cross-disciplinary collaborative model, characterized by the strong interaction among Research, Design and Execution. Jean-Yves SOËTINCK (France) – Owner of L’acte Lumiere . Child of the Lyon Lighting Masterplan», of which he admired the first illuminations in the city during his studies, he entered after his diploma in a famous Lyon’s Lighting Design office where he has worked on heritage projects of international scope. In 2001, he created his own lighting design agency “L’Acte Lumière”, specializing in the enhancement of spaces, architecture, and heritage through the light. His approach expressed through his agency name «L’Acte Lumière», aims to make each project a voluntary and dynamic «Action». Mojca GREGORSKI (Slovenia) – Owner and Leading Architect of Kontra arhitekti. Mojca Gregorski graduated in 2000 from the Faculty of architecture at the University of Ljubljana in Slovenia. She attended PhD study in Ljubljana as well as at the Universidad Politecnica de Valencia and Jagellonian University in Krakow, Poland. She had been getting her work experience in architectural offices abroad and in Slovenia before in 2009 she established her own office – MODULAR arhitekti (now KONTRA arhitekti). Her practical work consists of realisations in different architecture scales – ranging from small designs and houses to more complex urbanistic designs. Most of her realised work is in the field of public buildings (kindergartens, sport halls and complexes, home for elderly, castle renovation.). She is interested in realisations of contemporary architecture in response to contextual parameters as much as social influences. Results are based on constant investigations about new functional and spatial solutions. Buildings are interweaving to the surrounding environment, not trying to dominate it. It is important to be honest in the detail and in the use of materials. Boštjan VUGA (Slovenia) – Co-Founder SADAR+VUGA. Boštjan Vuga is an architectural practitioner, researcher and educator. Boštjan Vuga graduated at the Faculty of Architecture in Ljubljana in 1992 and completed the postgraduate master’s course at the AA School of Architecture in London in 1995. Together with Jurij Sadar, he founded SADAR+VUGA (S+V) office in Ljubljana in 1996, which in two decades took place as one of the critical European architectural practices with production and communication based on an open, integral and innovative concept. Their most acclaimed works include chamber of Commerce and Industry of Slovenia (1996), Central part of the National Gallery, Ljubljana (1996) Stadium and Multipurpose hall Stožice, Ljubljana (2010) and Air Traffic Control Centre Ljubljana Airport (2013) and Faculty of Social Works at the University Campus Ghent (2018). The office has received many national and global architectural awards as Bauwelt Prize, Iconic Award, Archmaraton Award, Piranesi award, Plečnik Prize and eight Mies van der Rohe Award nominations. Matej Vozlič (Slovenia) – Architect – Vesna & Matej Vozlič: arhitektura. In 2012, Ljubljana received the European Prize for Urban Public Space. This prestigious award was granted by the jury for a wholesome solution regarding public spaces along the Ljubljanica River. Next to the footbridges and the new bridges, the arrangement also included the riverbanks; a process in which the authorial contribution of Vesna and Matej Vozlič were of significant importance. They have been repeatedly dealing with this task since 1991 and received the Plečnik Medal in 1994 for the renovation of the ground surfaces of Cankarjevo nabrežje (the embankment of Ivan Cankar) in Ljubljana. The renovation process forced them to intervene into the very core of the old city which had already been renovated by Jože Plečnik; therefore in their work, they were divided between the respect towards the architect’s work and the continuation of his ideas. Maja Simoneti (Slovenia) – Project Manager – Institute for Spatial Policies. Maja is licensed landscape architect and spatial planner, interested in public policies and knowledge transfer. She has 30 years of experience in planning and design, she participated in several interdisciplinary projects on national, local and EU level, among others in preparation of National spatial strategy and Master plan for the capital city of Ljubljana. She is skilled in collaboration and communication and active in advocacy for public participation in planning and management. She is interested in applicative research of urban policies, green space planning and management, playgrounds, gardening, participation, and spatial literacy. In her doctoral, thesis she had linked practice and theory and studied how comprehensive and inclusive the system of spatial planning and management of public green space in Slovenia is. Currently she is involved with sustainable urban development and management, promotion of walking, universal design, relations between public health and urban development. Maja is an active member of Association of Landscape Architects of Slovenia and of Chamber for Architecture and Spatial Planning of Slovenia. Blaž Budja (Slovenia) – Architect – Jereb in Budja arhitekti. The office was founded in 2007 by Rok Jereb (1975, Ljubljana) in Blaž Budja (1975, Kranj). They focus strongly on thoughtful and detailed architecture, emphasizing relations between the local environment, functionality and the client. They won several architectural competitions: Sports hall Stopiče (Novo Mesto, Slovenija), Ljubljana main train station (in collaboration, Slovenija), Kokra Canyon revitalization (Kranj, Slovenija), Social housing (Ivančna Gorica, Slovenija) Foot Bridge over river Krka in Novo mesto and others. Spots Hall Stopiče was awarded with main Slovenian architecture award, Plečnik medal in 2012 and was nominated for the European Union Prize for Architecture Mies van der Rohe award 2013. In 2015 the Occupational Activity Centre INCE Mengeš won the Plečnik Medal. Jereb in Budja arhitekti won the 2017 Plečnik Prize and Golden Pencil award for the project Mothers Home Ljubljana. In 2019 The TEM Čatež factory Expansion was nominated for the European Union Prize for Architecture Mies van der Rohe award. The same project won the Golden Pencil award in 2018. Blaž Budja also practices architectural photography. Pako Radovanovic (Macedonia) is designer-architect, graduated at Accademia Italiana Firenze – IT. Currently working as a CEO of a family-owned studio Rado engineering in Skopje. Since he started working in 2001 he has worked on numerous different projects from interiors and private houses to commercial and residential buildings. For his work, he has won the grand prize for architecture for build project in Macedonia, twice once in 2014 for the “Sports center Jane Sandanski” and in 2016 for the “ T-House”. He has also won the ASK best interior in 2001. Participated in numerous Architectural exhibitions in the country and abroad. The SHARE Forum is expanded online through the communication platform between participants for 6 months. SHARE Ljubljana 2019 International Architecture and Engineering Forum is an event organized by ProEvent Association in collaboration with Chamber of Architecture and Spatial Planning of Slovenia.